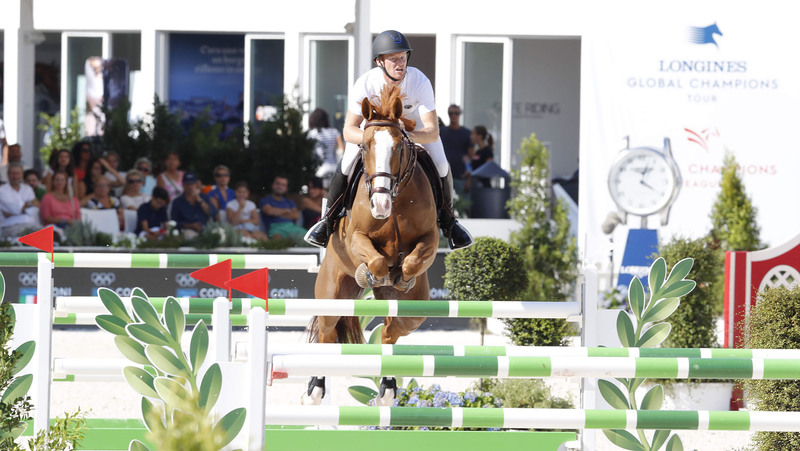 Niels Bruynseels (BEL) and the Italian bred mare Lady Cracotte blasted away the competition in a sizzling final CSI5* 1.55m class of the Longines Global Champions Tour of Rome. Bruynseels took a convincing win in Italy’s capital city, a full two seconds faster than the rest of the world-class field in a racy jump-off, second going to Bertram Allen (IRL) with Hector van d’Abdijhoeve, third to Pius Schwizer (SUI) with About A Dream and fourth to home star Gianni Govoni (ITA) with Antonio. As the sun lengthened across the picturesque Stadio dei Marmi, fans packed the grandstands to witness the final class of LGCT Rome. Italian designer Uliano Mezzani’s course was another technical test for the world’s top international horses and riders, with a tight time allowed of 78s. The track asked for plenty of pace, but left little margin for error as riders pushed to meet the forward distances, wide oxers demanding scope and power, with gappy verticals tumbling at the lightest of touches. Christian Ahlmann (GER) and Caribis Z were one of the first combinations to fall short of the tight time allowed, the pair jumping beautifully but picking up a costly fault after adding a stride to the last. Immediately after Yuri Mansur (BRA) and Opium du Soufflet CH were also caught out, and later Edwina Tops-Alexander (AUS) with new mount Vinchester also fell short. If there was a roof in the classic Stadio dei Marmi it would have been lifted by the cheers of the crowd as Bruno Chimirri (ITA) and Tower Mouche were the first to jump clear and within the time, the Italian rider delighted with his horse’s performance. Denis Lynch (IRL) with RMF Bella Baloubet would quickly join them, creating a jump-off, with 35 riders left to take their chance. There would be heartbreak for Ludger Beerbaum (GER) and Chiara, as the final fence fell and knocked them out of a chance of a top position today. And Italian hopes were dashed after Lorenzo de Luca (ITA) and Cynar VA came down too early on the back rail of the grape-lined oxer and ruled themselves out of the jump off. Compatriot Alberto Zorzi (ITA) and Danique did the same at the very same obstacle, and collected a time fault to boot. However there would be plenty of exciting names who would return to the ring for a chance at the prize money. Karel Cox (BEL) with Evert, Daniel Deusser (GER) and Calisto Blue, Scott Brash (GBR) with Hello Jefferson, Werner Muff (SUI) with Cornet MM, Rolf-Göran Bengtsson (SWE) with Oak Grove's Carlyle, Mark McAuley (IRL) with Jasco v. Bisschop, Julien Epaillard (FRA) with Virtuose Champeix, Emily Moffitt (GBR) with Tipsy du Terral, Peder Fredricson (SWE) with Catch Me Not S, Johan-Sebastian Gulliksen (NOR) with Via v. Karmenhoek Z, Gianni Govoni (ITA) with Antonio, Niels Bruynseels (BEL) with Lady Cracotte, Pius Schwizer (SUI) with About A Dream, Henrik von Eckermann (SWE) with Mill's Sheridan, and Bertram Allen (IRL) with Hector van d’Abdijhoeve would return. The 17-rider jump-off would keep the watching spectators on the edge of their seats, with the first to go their own Italian star, Bruno Chimirri (ITA). Leading the charge, and bolstered by the crowd, Chimirri set off at a pace with Tower Mouche, hoping to put the pressure on the competitors to come. But the first part of the combination fell, and the final fence caught them out - a delicate vertical off a turn from a flat out gallop - the crowd groaning in dismay. Experienced Irish rider Denis Lynch (IRL) set the pace with RMF Bella Baloubet with 45.66s, but leaving the door open after the grey mare wobbled on the turn to the last. The plank fell for Karel Cox (BEL) and Evert, the normally fast duo ruled out of contention. Daniel Deusser (GER) opted for a steadier route with Calisto Blue, but was two seconds slower than Lynch’s time. Olympic British rider Scott Brash (GBR) brought the 9 year old Hello Jefferson back to the sand arena, but the experienced rider also chose to educate his horse for the future, pulling out another steady clear with the superstar in the making and giving the young horse a calm and collected ride. There was drama for Julien Epaillard (FRA) and Virtuose Champeix as the horse bucked heading towards the first fence. Julien turned at the last minute to circle back, however had gone through the gates - counting the turn back as a refusal. Poles for Werner Muff (SUI), Rolf-Göran Bengtsson (SWE), Emily Moffitt (GBR), Mark McAuley (IRL) and Johan-Sebastian Gulliksen (NOR) ruled them out of contention. The crowd was set alight as Gianni Govoni (ITA) with Antonio flew around the course, spectators holding their breath as the pair took on the track at full throttle. They cleared the last with fans on their feet, cheering their local rider as he stopped the clock in 45s flat and took over the lead. Peder Fredricson (SWE) and Catch Me Not S kept up a steady pace, but couldn’t better the Italian’s time, finishing in 46.75s. Niels Bruynseels (BEL) set off at a gallop, roaring through the starting gates with Lady Cracotte, and keeping up the pace throughout the course. They were up from the start and the momentum built, the Belgian talent shaving an incredible two seconds off the time to turn up the heat in Rome with a new time to beat of 42.72s. Switzerland’s Pius Schwizer (SUI) and About A Dream had a slower tempo, but kept the rhythm throughout, crusing through the smoothest of turns to finish just behind Bruynseels in 44.14s. A pole for penultime rider Henrik von Eckermann (SWE) meant all the pressure rested on the final contender, Bertam Allen (IRL) - a talent notorious for his fast jump off performances. With Hector van d’Abdijhoeve looking in phenomenal form, Bertram powered through the first half of the course, flying from the first to second fence. The duo tried, but it wasn’t quite enough, stopping the clock in 43.94s and slipping into second. So it would be another CSI5* LGCT win for Niels Bruynseels (BEL), with Bertram Allen (IRL) in second and Pius Schwizer (SUI) taking third in the final class of the weekend. The Longines Global Champions Tour now looks to Doha, Qatar, for the 16th and final leg of the 2018 race, where Ben Maher (GBR) will be crowned 2018 Champion of Champions as the battle for second and third reaches fever pitch.